Information keeps coming ... Enjoy the holidays! 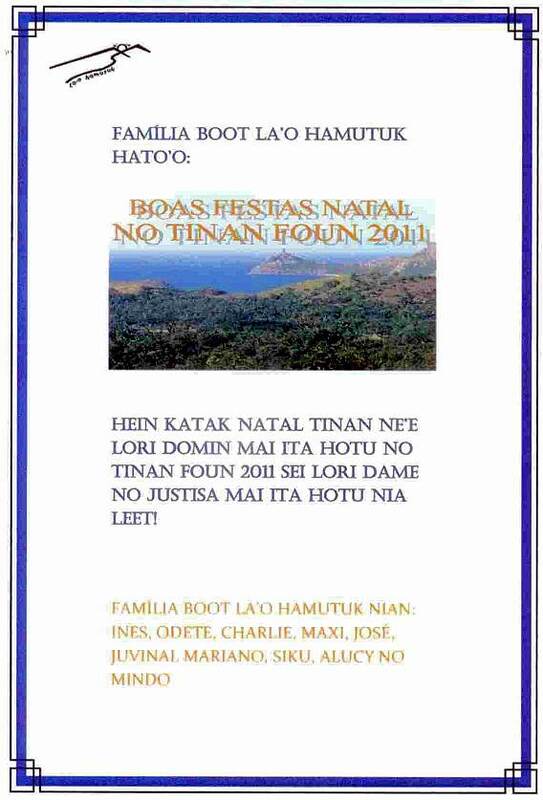 As we near the end of 2010, La'o Hamutuk has posted several interesting new documents, which we are sharing with our holiday wishes for all citizens and supporters of Timor-Leste. On 15 December, we asked Parliament not to approve the new Infrastructure Fund in the 2011 budget without receiving a list of proposed annual expenditures for multi-year capital projects. The next day, the Ministry of Finance provided a list to Parliament, and we scanned and translated it (also Portuguese) and added it to our web pages on the 2011 state budget. Unfortunately, it raises more questions than it answers. We asked Parliament to delay approving the Infrastructure Fund until they had debated, amended and enacted the National Strategic Development Plan. Although the plan itself is still under wraps (we published a leaked draft last May), we recently obtained the $3 million contract with PT DSI Makmur Sejahtera for "Strategic Development Plan Consulting Services" which the PM signed in September 2009 and paid last August (invoice). We added this contract to our web page on the Plan, as well as the contract's Terms of Reference and job descriptions for Key Personnel. Finally, our recent exposure of the huge delays and cost overruns of the heavy oil power plants and national electricity grid provoked public interest and official dishonesty, as described on our just-updated web page. We just posted the next monthly report from the supervising consultant. It shows that the project fell further behind in October, when only 11 towers were erected. At that rate, it will take until 2027 to finish. The consultant is alarmed by poor quality work and slow performance by Chinese Nuclear Industry Company No 22 (CNI22). Although the Government ordered CNI22 to subcontract the construction of the Hera and Betano power plants to Puri Akraya Engineering (the contract was signed on 15 September, increasing the project cost by $250 million), Puri Akraya hadn't started work by the end of October, while they waited for advance payment. The revised payment schedule obliges Timor-Leste to pay CNI22 and PAE $380 million in 2011 alone, a figure which will increase more when the transmission lines are subcontracted and "additional works not originally foreseen in the contract such as the Jetty to unload and pump the Heavy Fuel Oil to the tanks and all administrative buildings" are included. However, the budget the Government submitted last month appropriates only $166 million during 2011. Nevertheless, the Government paid CNI22 on schedule throughout 2010, even as the work lags further and further behind. 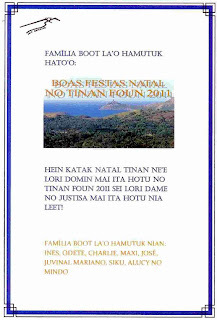 Boas Festa Natal no Haksolok Tinan Foun! The proposed revision of the Petroleum Fund Law threatens fiscal sustainability. The national electric project is much more expensive than it appears. Parliament and the public must have access to full information. The following is an abridged version of our submission. See the web version for graphics and links, or download the PDF version (also Tetum) for printing. Click for more information on the budget, including documents and analysis (also Tetum). Since 2008, Timor-Leste’s Government has pursued the dream of cheap, reliable electricity for the entire nation. The construction of heavy oil-fueled generation stations and a nation-wide high-voltage transmission lines is by far the most expensive project Timor-Leste has ever undertaken. The Government promised to provide 24-hour electricity in all district capitals by the end of 2009, and now hopes to achieve this by the end of 2011. But it is not happening. From the beginning, this project has been characterized by bad planning, dubious procurement procedures, incompetent contractors, illegal practices, poor oversight, and lack of transparency and accountability. La’o Hamutuk has written about this many times, and we are sad to report that reality is even worse than we had feared. La'o Hamutuk has obtained the confidential September 2010 Monthly Progress Report from the Italian joint venture Electroconsult and Bonifica, SpA” (EB) which the Government hired in July 2009 to supervise Chinese Nuclear Industry Company No. 22 (CNI22). The Government had contracted CNI22 six months earlier, but they were implementing the project without any clear specifications, valid tender, environmental impact analysis or public consultation. In response to criticism that the government was not managing the project effectively, Timor-Leste began paying EB $2 million per year as a consultant to oversee the project. The project is way behind schedule, and EB is very frustrated with the slowness and unresponsiveness of CNI22. EB says it “does not spare any effort” to press the Chinese company to speed up progress which they say is “below the satisfactory level required” to meet the 31 December 2011 completion date. The power plants have been removed from CNI22’s responsibility, at great expense. During September, the only work done on the Hera generating station was applying asphalt on the area where oil tanks will be place. Virtually nothing has been done at Betano, although the project timeline says work was to have begun in June 2010. Reassigning the contract for the generating stations, together with design changes, quadruples their cost from $91 million to $353 million. EB’s estimate of total project cost is now $629 million, nearly double the original $367 million CNI22 price. If schedule slippages continue and most of the transmission lines are also subcontracted, the costs will be far higher. Construction of the national electric grid is going extremely slowly, with only 1.2% of the towers having been erected so far, nearly all between Hera and Dili. EB notes “As discussed many time, the Contractor must, in every single calendar day, complete a minimum of” four excavations, four concrete foundations, and four tower erections “including tightening of bolts.” Most of the routes have not even been surveyed, and land disputes have caused a number of problems. The Government directed CNI22 to find other companies to build the most problematic parts of the national grid. CNI22 hoped to sign a contract in early October with the DCP company from Surabaya for the Liquica-Maliana-Suai segment. CNI22 was also talking with PT Karya Logam Agung from Jakarta about Suai-Cassa-Betano-Viqueque, and the Government has asked them to find a third subcontractor for Viqueque-Lospalos. Only one substation is being worked on. Although the foundation for the Dili substation is 80% complete, virtually no construction has been done on the substations planned for Manatuto, Baucau, Lospalos, Liquica, Maliana, Suai, Cassa and Viqueque. Hardly any Timorese workers are employed. In January 2009, the Prime Minister told Parliament that “this project will in itself create over 20,000 jobs already in 2009,” but by 28 May 2010, CNI22 had hired only 155 Timorese workers. The Government is “very unhappy” about this and has threatened to stop issuing visas to Chinese workers and to require CNI22 to employ four Timorese workers for every Chinese. CNI22 has asked EDTL to recruit local workers to be trained and employed by CNI22. The company is not taking adequate measures to safeguard health, safety and environment, endangering both project workers and the local communities. EB observes that “the quality of workmanship is deteriorating” when EB is not on site, and that CNI22 does “no cohesive planning,” “safety practices are far below regulations” and acts with “environmental negligence.” EB’s September report lists 14 serious “issues of concern” and eight more “problems/issues,” but their recommendations to CNI22 are rarely implemented. Nothing is said about Government awareness or involvement in trying to improve the situation. Legally required environmental clearances, right-of-way access permissions, environmental baseline survey and tree-cutting permits have not been done. CNI22 has not prepared a single monthly environmental report, although they have been required to do so since January 2010. Timorese workers receive less safety equipment than Chinese, and Chinese workers live in unsanitary, unsafe conditions. CNI22’s Health/Safety/Environment and Site Emergency plans “lack essential operational details” and need to be revised. The company has no formal process for complaints, has not replanted cleared areas, has no Solid Waste Management Plan, has not established buffer zones between residential and project areas, and has not complied with requirements for silt containment, oil and grease traps, sanitation facilities or waste treatment. On 18 November, the Prime Minister misled Radio Timor-Leste listeners [listen to unedited Tetum] by telling them that La'o Hamutuk's information that the Government had cancelled CNI22's contract was incorrect, and then talked about transmission towers. The journalist talked about the purchase of Finnish generators weighing 250 tons (which should have been 250 megawatts generating capacity), but neither he nor the Prime Minister mentioned that the Government had taken the generating station contract away from CNI22 and assigned it to Puri Akraya Engineering two months earlier. La’o Hamutuk is distressed that our dire predictions are being fulfilled, especially while the electricity situation in Dili and across the country becomes increasingly frustrating, and that public officials are concealing the extent of the project’s problems. Once again, we reiterate our call for transparent and accountable procedures consistent with law, public information, effective management and oversight, and well-considered planning and budgeting. When such practices are not followed, Timor-Leste not only wastes money and time, but loses opportunities to create infrastructure and develop our economy to improve our people’s lives. Update 1: On 21 December, we posted the EB report for October, and wrote a new blog entry with some of the highlights. Our web page includes media reactions and disinformation which emerged after this original posting, as well as a summary of project costs and the inconsistency between contractual obligations ($380 million in 2011) and the proposed 2011 State Budget ($166 million). Update 2: In January, Parliament increased the appropriation for this project in the 2011 State Budget to $447 million, raising questions about the sustainability of Timor-Leste's rapidly escalating expenditures. An order was placed with the Finnish company Wartsila for generators, and EB's November report highlighted scheduling and environmental problems. La'o Hamutuk will keep updating our web page to track ongoing developments. Oil and gas exploration activities in the Joint Petroleum Development Area (JPDA) and in Timor-Leste Exclusive Area (TLEA) are conducted under Production Sharing Contracts (PSCs) between the companies and the National Petroleum Authority or its predecessor, the TSDA. Under the 2005 Petroleum Act and the Interim Petroleum Mining Code, PSCs are public documents. PSCs signed in 2006 were posted to government websites which have been allowed to die. Since these very important documents are no longer on the internet, La'o Hamutuk has posted them to our website. We encourage the government to implement their legal obligation for transparency. Timor-Leste is the most petroleum-export-dependent country in the world. Oil money pays for about 90% of everything the Government does. But the oil companies cheat – they pay as little as they can get away with. After six years, Timor-Leste is beginning to scrutinize their tax returns, and has discovered what should have been expected – that companies have not paid all that they owe. We have already collected tens of millions in back taxes and penalties from ConocoPhillips and other companies, and further investigation is likely to reap much more. La’o Hamutuk has posted an article to our website explaining the tax system and some of the difficulties and irregularities Timor-Leste has encountered, as well as some recent successes. This blog entry is a greatly abridged version of that 4-page article. When taxes are calculated, the oil companies are entitled to deduct the expenses of operating the project through a process called cost recovery. This means that Timor-Leste effectively reimburses the company for expenses related to the project. There’s a lot of room for cheating. In November 2010, after several months of investigation, Timor-Leste sent a $32.4 million bill to ConocoPhillips (USA) and its joint venture (JV) partners Santos (Australia) and Inpex (Japan) for a cost the companies wrongly recovered from the Bayu-Undan project in 2005. The illegitimate cost was for an exploratory well named Firebird (sometimes called Phoenix, the red circle on the map). In 2003 ConocoPhillips reassessed old data and concluded that there could be a valuable natural gas field west of and under the Bayu-Undan field. Under their contracts, oil companies are required to give back parts of the contract area that they no longer want to explore, and they were supposed to relinquish the pink area in 2004. The companies asked the Timor Sea Designated Authority (TSDA) regulator for time to drill one more well at Firebird, which they thought might contain 1.4 tcf of gas, about ¼ as much as Bayu-Undan. The TSDA granted the extension in February 2004, but told the companies not to charge Firebird costs against Bayu-Undan revenues. They would only be able to recover these exploration costs if Firebird became a commercial project. The Firebird well drilled at the end of 2005 found only small amounts of gas, and the well was plugged and abandoned. The companies relinquished the area. Contrary to their agreement with TSDA, the companies charged the $32 million cost of the well against Bayu-Undan revenues, reducing their tax payment by $9.7 million. Timor-Leste reopened this issue this year. On 24 November 2010, Timor-Leste ordered ConocoPhillips, Inpex and Santos to pay $32.4 million, including $9.7 million in back taxes, as well as a 100% penalty for gross negligence and 1% per month interest and penalties for late payment. In early December, Inpex paid $7.1 million, Santos paid $5.1 million, and ConocoPhillips has agreed to pay $19.5 million (although the companies could still appeal within the Ministry of Finance). Oil companies often buy and sell their ownership in different projects. If they get more for selling their shares than they spent on developing them, they have to pay capital gains tax, which is 30% in Timor-Leste. Although several such sales have occurred in the JPDA, the companies have not paid this tax. Current investigations are likely to produce payments for overdue taxes from Woodside, Santos and other companies, which is discussed in more detail on our website. In December 2010, Timor-Leste’s National Directorate of Petroleum Revenues will begin to audit Bayu-Undan tax returns since 2005, the first time Timor-Leste has audited petroleum tax returns. External audits have turned up nothing, which is not surprising since the auditor has been paid by the companies. Timor-Leste has recently obliged the companies to keep copies of records in Timor-Leste, which will make audits possible. Timor-Leste is the owner of the oil and gas in the ground, and it writes the contracts and the laws. For our people’s sake, we are glad that they are finally being enforced more effectively. Iha loron 26 Novembru, La'o Hamutuk hetan konvite atu partisipa iha audiensia Komisaun D (Agrikultura, Floresta, Rekursu Naturais no Ambiente) Parlamentu Nasional, atu fahe hanoin kona-ba orsamentu. Tuir mai, ami hakerek submisaun ida ba Komisaun D (mos Ingles). Mantein nafatin gastus iha nivel sustentavel, bazeia ba projeksaun presu mina-rai iha futuru ne’ebe prudente. Proposta orsamentu ne’ebe sai maka’as ba 2011 no 2012 tenke limita, no atu foti osan husi Fundu Petroleu iha tinan oin mai labele liu Rendimentu Sustentavel Estimadu. Halo klaru katak gastus tenke iha koneksaun ho rendimentu, no rendimentu mina-rai ne’ebe sae iha relasaun ho rendimentu estadu ne’e sei akontese temporariu deit. Fo fundus adisional ba Ministeriu Agrikultura no Peskas no enkoraza nia atu implementa politika ida ne’ebe bele hatan ba nesidade agrikultor lokal. Insiste ho klaru kona-ba kustu informasaun no rendimentu no projeksaun kampu servisu ba siklu projeitu tomak iha projeitu Tasi Mane, hodi nune’e Parlamentu bele deside karik projeitu sira ne’e razoavel atu halo investimentu rekursu estadu nian. Evalua katak gastu ho montante boot husi osan povo nian atu prepara planta LNG iha Beacu sei iha valor no vantazem, tamba kompania ho poder atu halo desizaun lakohi atu konsidera opsaun ida ne’e. Prioritize dezenvolvimentu ne’ebe maka’as ba iha seitor ekonomia naun-petroleu, ba dala uluk ba agrikultura, atu troka industria mina no rendimentu petroleu temporariu. Rejeita alokasaun orsamentu ba kompania mina-rai nasional PETRONATIL to kompania ne’e estabelese husi lei Parlamentar ida ho salvaguarda ida ne’ebe adekuadu, iha akuntabilidade no transparansia. Rejeita alokasaun orsamentu ba Institutu Petroleu no Geologia nudar institutu autonomu, maibe alokasaun nafatin iha strutura SERN. Rejeita atu estabelese Fundu Infraestrutura to’o kustu annual nian kompleta no deitalhadu. Kampu servisu, informasaun orariu ba kada projeitu, no to’o Parlamentu aprova ona Planu Estratejiku Dezenvolvimentu Nasional, ho Lei no orgaun ne’ebe nesesariu. Insiste katak orsamentu tenke fo prioridade ba edukasaun sidadaun Timor-Leste iha Timor laran duke haruka funsionariu publiku balun ba eskola iha rai liur ne’ebe karun teb-tebes. Permite atu aumenta funsionariu sira ba ministeriu xave sira hanesan saude, edukasaun no agrikultura, no mos atu jere no taumatan ba infraestrutura foun ne’ebe foin haluan ba. Bele hetan informasaun tan kona-ba proposta Orsamentu Estadu 2011, inklui dokumentu sira, relatoriu ezekusaun no komentariu ruma iha http://www.laohamutuk.org/econ/OGE11/10OJE2011Te.htm. On 26 November, La'o Hamutuk was invited by Timor-Leste's National Parliament Committee D (Agriculture, Forests, Natural Resources and Environment) to share perspectives about the proposed General State Budget for 2011. After the hearing, we prepared a 10-page submission for the Committee (also Tetum). Keep spending within sustainable levels, based on prudent projections of future oil prices. The proposed massive budget increases for 2011 and 2012 should be limited, and withdrawals from the Petroleum Fund in future years should not exceed the Estimated Sustainable Income. Emphasize that expenditures are connected with revenues, and that the current surge in petroleum-related income is only temporary. Provide additional funding to the Ministry of Agriculture and Fisheries and encourage it to implement policies which address the needs of local farmers. Insist on clear cost information and revenue and employment projections for the full project cycle of the Tasi Mane projects, so that Parliament can decide if they are a reasonable investment of state resources. Evaluate whether spending large amounts of public funds to prepare for a possible Beaçu LNG plant is worthwhile, since the company with decision-making power refuses to consider that option. Prioritize development of a strong non-oil economy, primarily based on agriculture, to replace transient oil revenues and industry. Reject funding for the PETRONATIL national oil company until it has been established by Parliamentary law with adequate safeguards, accountability and transparency. Reject funding for the Institute of Petroleum and Geology (IPG) as an autonomous institute, but provide for it within the structure of SERN. Refuse to establish the Infrastructure Fund until complete and detailed annual cost, employment and schedule information is provided for each project, and until Parliament has approved the National Strategic Development Plan, with necessary organs and laws. Insist that the budget give priority to education of Timor-Leste citizens in Timor-Leste, rather than sending a few public servants for expensive schooling overseas. Allow hiring of additional personnel for key ministries like health, education and agriculture, as well as to manage and maintain newly expanded infrastructure. More information on the budget, including budget documents, execution reports and analysis, is available at http://www.laohamutuk.org/econ/OGE11/10OJE2011.htm. Every year, the U.S. Government's Millennium Challenge Corporation evaluates countries for their eligibility to receive large grants under the MCC program. Countries which fall below certain levels can receive "Threshold" funding to help bring their scores up, and Timor-Leste entered this category in 2007, after its scores fell from previous years. Click here for more information about MCC and Timor-Leste. MCC just released its scores for 2011. Timor-Leste did worse on 11 criteria compared with the previous year, and improved on 4, with two unchanged. Timor-Leste fell from 21% to 10% in the key "Control of Corruption" indicator, continuing a downward trend since 2006. MCC uses a pass/fail (green/red) system. To pass, Timor-Leste must be better than at least half of the low-moderate income countries rated. To become fully compact-eligible, (as we were in 2005-6),a country must be "green" for Corruption and the majority of scores on each line of the chart at right. Timor-Leste needs to pass Corruption, and at least two additional indicators in the "Investing in People" category, and one more in the "Economic Freedom" category to return to Compact Eligibility, which will be re-evaluated in a year or two, after the threshold program is implemented. Dokumentu Governu nian ne’ebe propoin Orsamentu Jeral Estadu 2011 ilustra frakeza fundamental iha planeamentu finanseiru — failansu ne’e atu fanun ita katak, karik estadu gastu osan barak husi Fundu Petroleu iha tempu badak nia laran, iha futuru osan sei menus. Maibe, kapitulu gastu nian esplika katak Governu iha planu atu foti tokon $418-$526 as liu RSE husi Fundu kada tinan-tinan hahu iha tinan 2012 (linha kor matak kot-kotu iha eixu da direita), estabelese ba kresimentu annual 3.5% iha gastu estadu nian hafoin eleisaun 2012. Iha kazu ne’e, balansu iha Fundu (linha kor matak tomak) hahu atu tun iha 2024, no Fundu sei uza hotu iha tinan 2035 karik laiha ona projeitu gas ka mina-rai atu mai tan. Ba orsamentu 2011, Governu asumi katak futuru presu mina-rai nian sei sai 50% as liu duke asumsaun ne’ebe sira halo tiha ona ba Orsamentu Estadu 2010, ne’ebe La’o Hamutuk hare katak viola tiha rekizitu Lei Fundu Petroleu nian katak “asumsaun tomak ne’ebe halo tenke prudente.” Asumsaun ba presu as nian uza hela iha senariu rua ne’ebe diskute iha leten. Karik senariu ida kalkula fila fali dadus bazeia ba asumsaun presu mina-rai nian ba orsamentu 2010, ho nivel gastus nian iha orsamentu 2011, balansu Fundu Petroleu nian (linha tolu ho kor roxo) sei hotu tomak iha 2030. Liga iha ne’e atu hetan dokumentu no informasaun tan kona-ba OGE 2011, inklui Kalendariu audensia Parlamentar no diskusaun plenaria nian. The Government’s documents proposing the 2011 State Budget illustrate a fundamental flaw in financial planning -- a failure to realize that if the state spends more money from the Petroleum Fund in the short term, less will be available for the future. However, the Expenditure chapter explains that the Government plans to withdraw $418-$526 million more than ESI from the Fund every year starting in 2012 (dashed double green line, right axis), settling down to a 3.5% annual increase in expenditures after the 2012 election. In this case, the balance in the Fund (solid double green line) starts to decline in 2024, and the Fund will be used up by 2035 if no new oil or gas projects come on-line. For the 2011 budget, the Government has assumed that future oil prices well be about 50% higher than were assumed for the 2010 budget, which La’o Hamutuk believes violates the Petroleum Fund Law’s requirement that "all assumptions made shall be prudent.” The higher price assumptions are used in the two scenarios discussed above. If one re-calculates the data based on the oil prices assumed for the 2010 budget, with the level of expenditures in the 2011 budget, the balance in the Petroleum Fund (triple purple line) will be entirely exhausted by 2030. Click here for more documents and information about the 2011 State Budget, including the calendar of Parliamentary hearings and plenary discussions. Timor-Leste's State Secretariat for Natural Resources recently opened a brief public consultation on a decree-law to create PETRONATIL, a state-owned petroleum company. They hope that the Council of Ministers will approve it on 30 November, and the proposed 2011 General State Budget allocates two million dollars to get it started. La'o Hamutuk has many serious concerns about this proposed legislation, which we described in our submission, available for download here. The public consultation process is inadequate. PETRONATIL should be established by Parliamentary law, not decree-law. PETRONATIL should serve the people of Timor-Leste. PETRONATIL should follow the rules for state agencies. PETRONATIL needs to be transparent and accountable. PETRONATIL should be designed to prevent corruption. PETRONATIL should not be given more power than it needs. PETRONATIL’s profits must be paid into the Petroleum Fund, not reinvested in the company. PETRONATIL should not be empowered to borrow or issue bonds. We also made a submission on the Institute for Petroleum and Geology (IPG) draft law, recommending that it be established as a department of the State Secretariat for Natural Resources, rather than an autonomous agency with wide-ranging powers and little accountability. Click here for the draft laws and background information. On 15 November, the Government presented copies of a six-volume set of budget books to Parliament, some in Portuguese and some in English. Although the Ministry of Finance refuses to make electronic copies of the $985 million budget available, La'o Hamutuk has scanned the budget law, its annexes and the Explanatory Note, translated them to English and posted them on our website, which includes analysis and related documents. Download all of Book 1 and the Law, with annexes, as a 1.3 MB PDF file. 2011 Budget, Petroleum Fund Law, PETRONATIL - Oh my! Public consultations on the creation of a new National Oil Company (PETRONATIL) and the Institute of Petroleum and Geology (IPG) (18 Nov.). The Petroleum Fund Law has served Timor-Leste well over the last five years, and there is no pressing need to revise it. It should provide policy continuity and protect our oil and gas wealth for future generations, and not only support current activities. It's too soon to put half the Fund in the stock market. The proposal is to increase the amount allowed in equities from 10% to 50%, even though the Ministry plans only 25% equities and the Investment Advisory Board (IAB) recommended a 40% maximum. Since Timor-Leste's experience with equities began only last month, we suggest that the current 10% limit continue for at least two years, while our managers, leaders and people gain experience and familiarity with the ups and downs of stock prices. Diversification can be helpful, but it is not gospel. It can include bad as well as good investments, and must be managed carefully. Diversification also applies to advice (getting more inputs and consultation) and productive sectors (not depending only on petroleum for revenues). Alternative instruments are dangerous. The proposal is to allow up to 5% of the Fund ($330 million) to be invested in real estate, private equities or other items not traded on regulated markets. This could include scams like Asian Champ Investments, or the kind of speculation that brought Nauru from the richest country in the world (per capita) to one of the poorest. Can leaders elected for five years successfully implement the long-term investment strategy necessary to maximize the return on equities investments? This is how Warren Buffet became rich, but political and short-term pressures from a country with tremendous needs may make it impossible. The Investment Policy defined in these revisions should be a public document, with legal force and approval above the Minister of Finance. Don't weaken the sustainable income rule. The proposal is to change the "detailed explanation" to a "justification" when the Government wants to spend more than 3% of Timor-Leste's petroleum wealth in one year. This could be a single sentence of political intention. Although the current guideline has not worked well in recent years, we do not believe it should be made easier to violate, and have proposed changes which will make it more effective in protecting the nation's nonrenewable wealth. Keep the Banking and Payments Authority as Operational Manager. The BPA has worked well as a professional, nonpartisan, independent state institution and has built its capacity and experience during the last five years of managing the Petroleum Fund. We believe that the proposal to replace it with an undefined agency "accountable to the Government" will reduce checks and balances and professionalism, endangering the security of the Fund. Maintain the independence of the Investment Advisory Board. The proposal is to remove voting powers from the BPA and Treasury representatives, to have all IAB members appointed by the Prime Minister (instead of the Minister of Finance), and to reduce the protection against conflict of interests. These are dangerous steps which will make the board more subject to political pressures. The Ministry of Finance will propose their revisions to the Council of Ministers soon, which will send them to Parliament for enactment. We hope that their long-term consequences are considered carefully. Click for more information on the Petroleum Fund and on the revision process, with links to many documents. Public comments were due 5 November. LH's comment. In the five years since it was unanimously enacted by Parliament, Timor-Leste's Petroleum Fund Law has served the nation well. We have accumulated more than $6.6 billion dollars in the fund, which has provided a model for other oil-export-dependent countries of responsible and safe revenue management. Our conservative investment strategy made Timor-Leste's Petroleum Fund the only Sovereign Wealth Fund in the world not to lose money during the 2008 global financial crisis, even though the return on investment has been less than many had hoped. The Law's guideline of spending no more than 3% of the nation's total petroleum wealth in a single year has supported consideration of long-term fiscal sustainability (even though the Government overspent the rule in 2009 and 2010). The prohibition of the use of the Fund as collateral for loans has helped to encourage fiscal responsibility, a counterweight to pressures to spend large amounts of money quickly. Timor-Leste's Petroleum Fund pays for 95% of state activities, including provision for many people's basic needs. Without oil and gas revenue our state would be bankrupt and our people would be hungry. Poverty will increase, and we will not be able to use our non-renewable petroleum birthright to build a non-oil economy which can function after the oil and gas runs out in less than a generation. Imminent revisions to the Petroleum Fund law endanger the security it has provided since 2005. Risky investments could lead us down Nauru's path from wealth to poverty. Spending beyond sustainable levels will impoverish our grandchildren, especially in light of our growing population and high rate of inflation. Since last year, the Ministry of Finance has been preparing to revise the Petroleum Fund law, hiring consultants, drafting papers, and holding private and public meetings. The pace has increased during the last two months, with the goal of passing revisions through Parliament by the first quarter of next year. La'o Hamutuk believes it is important for every citizen to have a chance to give informed input to decisions that will impact their lives for the indefinite future. In early September, the Fund's Investment Advisory Board released a Statement of Investment Beliefs and Principles which encourages diversification into equities (stocks) as well as bonds, using external managers. During the past three weeks, the Council of Ministers has had several discussions on diversifying current investments (90% in government bonds, up to 10% in traded stocks) to include more stocks, as well as real estate, infrastructure, and other instruments. Given the attempt to scam the Fund of a billion dollars last year, caution is required. Although everyone wants the Fund's investments to earn a higher return, wishing doesn't make it so. Risking the Fund's principal in the hopes of high profits will endanger the future of our children, and a state which faces the voters every five years may not be able to carry out a long-term investment strategy, with gains and losses to the invested principal. The Council of Ministers has considered other revisions to the law, including weakening the justification required for spending unsustainably, and the Ministry of Finance circulated draft amendments to the law (also Portuguese) at a "mini-seminar" on 23 October, asking for comments by 5 November. The draft amendments allow up to 50% of the Fund to be invested in equities (stocks), including up to 5% in "alternative" investments like real estate, infrastructure or private equities. A summary of La'o Hamutuk's submission is available here, and the full text is here. On 18 October , the Ministry of Finance announced the appointment of Schroders Investment Management Ltd. to manage $260 million of the Petroleum Fund, which they will invest in stock, using the flexibility in the current law. La'o Hamutuk hopes that there will be a serious discussion of these proposed changes, which will include many perspectives on their benefits, drawbacks, implications and risks. Who is Responsible to End Impunity? The Indonesian occupation of Timor-Leste ended eleven years ago, and our people continue to demand justice for the masterminds of the crimes committed from 1975 through 1999. La’o Hamutuk will organize a public meeting to discuss whether Timor-Leste has to continue to live in a climate of impunity, and what has been done and can be done to hold perpetrators of serious crimes accountable. Place: The CAVR office, former prison, Balide, Dili. Speakers: Judge Maria Natercia Gusmão (former UNTAET Special Panels judge, not yet confirmed), Martinho Rodrigues (representing victims), Charlie Scheiner (international human rights activist), Celestino Gusmão (National Alliance for an International Tribunal), Vice-Minister Ivo Jorge Valente (Vice Minister for Justice), MP Jose Teixeira (Minister in previous government), Louis Gentile (representative of the High Commissioner for Human Rights, not yet confirmed), MP Fernanda Borges (Chair of Committee A, National Parliament). On 25 October 1999, the United Nations Security Council approved Resolution 1272 to establish the UNTAET Mission in Timor-Leste “which will be endowed with overall responsibility for the administration of East Timor and will be empowered to exercise all legislative and executive authority, including the administration of justice.” That date marks the official end of the Indonesian occupation, and the legal transfer of administrative responsibility for Timor-Leste from Portugal to the United Nations. During the next few months both UN and international investigations concluded what was obvious at the time – that Indonesian-directed occupation and destruction of Timor-Leste was organized, systematic, widespread and involved the commission of numerous Crimes against Humanity, war crimes, and other serious offenses. Various justice processes since then have failed to judge the Indonesian military and political leaders who are responsible for these serious, international crimes. UNTAET tried to cooperate with the Indonesian government to achieve justice, but Jakarta lacked the political will to follow through on its commitments. The UN and other nations, in spite of repeated declarations that impunity can never be tolerated for crimes of this magnitude, have failed to fulfill their obligations and promises. La'o Hamutuk has published a new web page in English and Tetum on ASEAN and Free Trade and its implications for Timor-Leste. In 2002 Timor-Leste became an observer to the Association of South-East Asian Nations (ASEAN), and our Government of Timor-Leste is now working to become a full member. ASEAN includes Indonesia, the Philippines, Brunei, Thailand, Malaysia, Singapore, Laos, Cambodia, Burma and Viet Nam, with agreements and cooperation focused socio-cultural, security, and economic areas. To join ASEAN, Timor-Leste must accept neoliberal agreements on free trade among all ASEAN members, as well as with India, China, South Korea, Japan, Australia and New Zealand. These agreements will force Timor-Leste to obey rules on tax policy, Foreign Direct Investment and other social and economic policies, limiting our independence an ability to control our economy. La'o Hamutuk believes that Timor-Leste should decide its social and economic policies and strategies, to most benefit our local economy, before evaluating benefits and risks of ASEAN membership. We believe that Timor-Leste's high dependency on imports, small amount of local production and lack of barriers to market access means that we will receive few economic benefits from joining ASEAN, which comes with great risks. The huge Italian oil company Eni operates several contracts for oil exploration in Timor-Leste's Exclusive Area and in the Joint Petroleum Development Area. Even before receiving approval for drilling the Cova-1 well in S06-03 of the TLEA, this month, Eni requested permission to drill up to three more wells in this area. La'o Hamutuk's submission urges a more deliberative regulatory process, and we encourage the National Petroleum Authority (ANP) to consult the public on health and safety issues (including spills and accidents), in addition to the consultation being done by the RDTL Directorate for the Environment on environmental effects of normal operation. Eni and DNMA have scheduled a consultation meeting for all interested parties on 27 October at 10:00 am at Eni's Dili office. Please RSVP in advance to Jose Pires of Eni (730 5079, jose.pires@enitimorleste.tl). Eni just announced another public consultation, on the final EIS for the Kitan project. Click here for La'o Hamutuk's page on this project (including our April 2010 submission), and here for Eni's page with the relevant documents. Eni invites comments until 19 November 2010. Kitan will be the first oil or gas project to start production since Timor-Leste became independent. Although it will provide only about 3% as much revenue as Bayu-Undan, it is an important test and learning experience for regulators, companies and civil society as this new nation enters into perilous waters. Semana hirak tan, Konsellu Ministru sei propoin Orsamentu Jerál Estadu tinan 2011, ne'ebé dala ruma to’o dollar biliaun ida, ba Parlamentu Nasionál. Iha preparasaun ba diskusaun ne'e, La'o Hamutuk halo tiha ona gráfiku tolu kona-ba realidade fundamentál ekonomia nian iha Timor-Leste. Bainhira faktus sira be hadalan ne’e bele komprende ba, orsamentu tinan oin mai ne’e hare ba atu sai hanesan la sustentavel liu tan no la prudente kompara ba orsamentu rektifikativu tinan-klaran nian ne’ebe pasa ona iha fulan haat liu ba. Fekit ba kada gráfiku ida-idak hodi haree ho dimensaun boot liu tan..
Dependénsia ba importasaun sira ne'e la saudável no la sustentável. Ohin loron, agrikultura no indústria iha Timor-Leste la bele fornese ita nia nesesidade sira lor-loron. Gráfiku iha sorin loos ne'e bazeia ba estatístika ofisiál; realidade, importasaun provavelmente aas liu porsentu 50% husi tokon $283 iha relatoriu tinan 2009, bainhira esportasaun menus husi tokon $10. Karik ita la bele prodús ita nia aihan rasik, be, sementi no nesesidade bázika sira seluk, oinsá ita sei bele moris bainhira ita la iha ona osan husi mina-rai nian hodi selu ba sosa sasán sira ne`ebe mai husi tasi-balun? Gastu estadu nian sa'e makaas liu duke ekonomia doméstika. Karik ita hasai tiha despeza governu nian, ekonomia naun-petroleu Timor-Leste nian stagnadu no dala ruma tun ka diminui. Ho rendimentu governu nian maizumenus 95% mai husi mina-rai no gas, ekonomia saidá mak ita sei iha hafoin mina-rai ho gás ne’e uza hotu ona? Ita nia rezerva petróleu ki'ik no limitadu. Maske ita susesu hodi lori kadoras gás Sunrise nian mai Timor-Leste, no mesmu karik esplorasaun foin daudauk ne'e hetan tan depózitu foun mina-rai ka gás nian hodi dezenvolve, ita nia osan totál mina-rai nian hare ba dalaruma menus husi biliaun $50. Karik ita gasta hotu bainhira sira tama mai, rata-rata ba ita nia populasaun nian no tinan 40 produsaun nian, rata-rata ida ne'e besik $1.65 ba kada sidadaun ba loron ida, ka menus dala rua husi Orsamentu Estadu 2010. Karik osan mina nian hasai hotu ba projetu infraestrutura ne'ebé konsidera la iha kualidade, importasaun ne'ebé lolos ita bele evita, ka fahe ba grupu perturbador, ita nia povo barak mak sei la hetan benefisiu. In a few weeks, the Council of Ministers will propose the 2011 General State Budget, which may be close to a billion dollars, to the National Parliament. In preparation for that discussion, La'o Hamutuk has made three graphs of fundamental economic realities in Timor-Leste. Unless these underlying facts are understood, next year's budget is likely to be even more unsustainable and unwise than the mid-year budget adjustment passed four months ago. Click on each graph to see it larger. Dependency on imports is unhealthy and unsustainable. Today, agriculture and industry in Timor-Leste cannot provide for our daily needs. The graph at right is based on official statistics; in reality, imports are probably 50% higher than the $283 million reported for 2009, while exports are less than $10 million. If we cannot produce our own food, water, cement, and other basic necessities, how will we survive when we have no oil money to pay for buying them from overseas? Government spending is growing faster than the domestic economy. If you subtract out government expenditures, Timor-Leste's non-oil economy is stagnant and probably shrinking. With about 95% of government revenues coming from oil and gas, what economy will we have after the oil and gas is used up? Our petroleum reserves are small and finite. Even if we succeed in bringing the Sunrise gas pipeline to Timor-Leste, and even if current exploration finds new oil or gas deposits to develop, our total oil revenues are likely to be less than $50 billion. If we spend them all as they came in, averaged over our population and 40 years of production, this averages about $1.65 per citizen per day, or less than twice the 2010 State Budget. If the oil revenues are squandered on ill-considered infrastructure projects, avoidable imports, or handouts to troublesome groups, most of our people will not benefit. La’o Hamutuk foin lansa pajina web foun ne’ebe inklui kopia ba esbosu Kodigu Sivíl, submisaun no rekursus seluk iha lingua Ingles no Tetum. Semana kotuk Komisaun A Parlamentu Nasional simu submisaun kona-ba esbosu Kodigu Sivil. Kodigu Sivil mak baze ba lei sivíl iha Timor-Leste, no iha impaktu ba ema Timor-oan husi moris to’o mate. Esbosu Kodigu Sivil hatete regras kona-ba kazamentu, adopsaun, paternidade, alimonia, divorsiú no warisan/eransa. Esbosu mos kria regras kona-ba direitu ba ema ne’ebe arenda rai no direitu uma-nain, akordus aluga rai, oinsa okupasaun legal, konpensasaun, hipoteka no direitu ba bee. Esbosu Kodigu Sivil iha pajina liu 500, no iha “kopia pas” husi Kodigu Sivil Portugal-nian, Kodigu Sivil ne’e la konsidera pratika lokal no kustume iha Timor-Leste. Esbosu Kodigu Sivil mak lei primeiru husi pakote esbosu lei kona-ba propriedade ne’ebe Komisaun A atu konsidera. (Planu uluk atu haree ba esbosu Lei ba Rai, maibe Komisaun deside hafoin Kodigu Sivil). La’o Hamutuk nia submisaun hato’o preokupasaun balun katak esbosu Kodigu Sivil sai ameasa ba ema ne’ebe vulneravel nia direitu ba rai, direitu ba uma no direitu ba bee. La’o Hamutuk ezizi ba Parlamentu atu hein to’o governu Konsultasaun Nasional kona-ba Rai molok aprova lei ne’ebe liga ba direitu ba propriedade. Ami prontu atu simu dokumentu no analiza tan husi parte hotu. La'o Hamutuk has launched a new web page which includes copies of the draft Civil Code, submissions and other resources in English and Tetum. Last week Parliamentary Committee A received submissions on the draft Civil Code. The Civil Code is the basis of civil law in Timor-Leste and will affect Timorese people from birth to death. It outlines rules on marriage, adoption, paternity, alimony, divorce and inheritance. It also creates rules on tenant and landlord rights, leases, the legal terms of occupation (similar to squatter's rights), mortgages and water rights. The draft law is over 500 pages and a "copy and paste" from the Portuguese Civil Code with little adaptation to local practice and custom. The draft Civil Code is the first of a new packet of draft laws on property rights that Committee A will review. (Earlier plans to examine the draft Land Law were put on hold until after the Civil Code.) La'o Hamutuk's submission raised concerns that the draft Civil Code threatens vulnerable people's land, housing and water rights. We urged Parliament not to enact new laws on property rights until government has held a National Land Consultation. We welcome further documents and analysis from all sources. Iha loron Domingo, 10/10/2010, iha mundo tomak ema rihun ba rihun sei selebra kampanye internasional ba hamenus gas estufa (gas rumah kaca) ho tema limete komisaun gas estufa to’o 350 ppm hodi bele salva ita nia mundu ne’e. Iha Timor-Leste, komisaun organizadora sira hakarak atu propoin ba Sua Exelencia, atu hato’o mensajem politika atu populasaun sira iha Dili bele hola parte iha kampanye ne’e ho asaun konkretu ba hapara mobilizasaun tranporte publiku loron ida iha Dili laran durante oras ida hahu husi tuku 15:00-16:00 OTL (Loron Domingo, 10/10/2010). Asaun konkreta ida ne’e atu hatudu ba mundu, solidaridade povu Timor-Leste ba povu Mundial nebe loron hanesan halao hela kampanye ba limita emisaun gas estufa, nune bele salva ita nia mundo ne’e. Deklarasun no dokumento relevante sira iha annexu. Liu husi karta ida ne’e, ami husu favour ba Sua Exelencia atu bele kualia ba publiku kona ba importansia hamenus gas estufa ne’e iha Timor-Leste nomos enkoraja ba publiku atu bele partisipa iha kampanye ida ne’e. Sua Exelencia nia apoio moral ne’e nudar forsa bo’ot ida ba hasae konsiensia publiku nian kona ba jestaun ambiente (hamenus lixu, hamenus emisaun, hapara importasaun kareta tuan, haforsa konservasaun biodiversidade no seluk tan).